Mains power is due to be lost from 1500hrs on Friday 17th March 2017. This will affect Echolink only, the repeater itself will continue to operate normally. The power is expected to be reinstated by 0800 Monday 20th March 2017, if not sooner. Rich (G0ZEP) will be carrying out work on both GB3DT and GB7CM on Saturday 22 October. Hopefully noise on both repeaters should be reduced. Throughout the morning either or both of the repeaters may be down while work is carried out. Signal reports are always welcome. GB3DT is undergoing some trials and tests this weekend from 1500hrs on Friday 2 September to approximately 1000 Monday 5 September. For this period, the repeater will be in AUTO <> AUTO mode so if C4FM is received, it will be re-transmitted. We would be interested to see how Analogue and Digital interact as well as general signal reports. It would be appreciated if C4FM users enabled AMS so should an analogue user call in and that Analogue users enable CTCSS on their Receive signal (to stop the digital hiss that is received when digital is used). There will be mains power outages to various parts of the GB3DT repeater systems over the coming few days. Both the repeater and Echolink nodes have backup battery power so should continue to function normally. 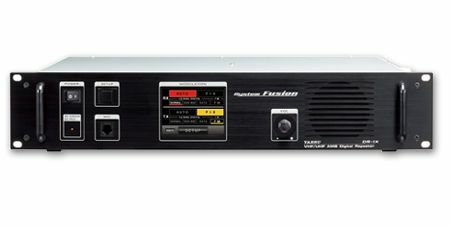 The GB3DT repeater has been upgraded to a Yaesu System Fusion repeater (DR-1X) to replace the MOULD system that was previously in operation. This has been initially purchased by Joe (2E0OEM), Alex (M1LXM) and Rich (G0ZEP) with the hope that the long suffering noise problem from being ‘secondary users’ on the tower, would be significantly reduced. 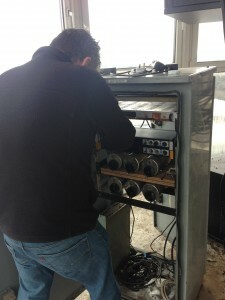 At the same time as upgrading the repeater, a battery backup was installed to enable the repeater to continue to operate should the mains power fluctuate or be disrupted. This is provided by a 13.5V, 35A mains powered power supply connected in parallel with the repeater and a 12V 65AH AGM Battery. 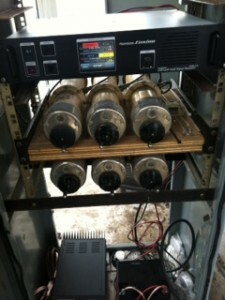 This has been tested and will keep the repeater operating for at least 12 hours without mains power. Following the upgrade, the existing filters were also adjusted to reduce CTCSS noise from weak signals but further work may be carried out over the coming few weeks as required. Initial reports have been very positive following the upgrade and the repeater team would be grateful of any feedback over the air or by e-mail.